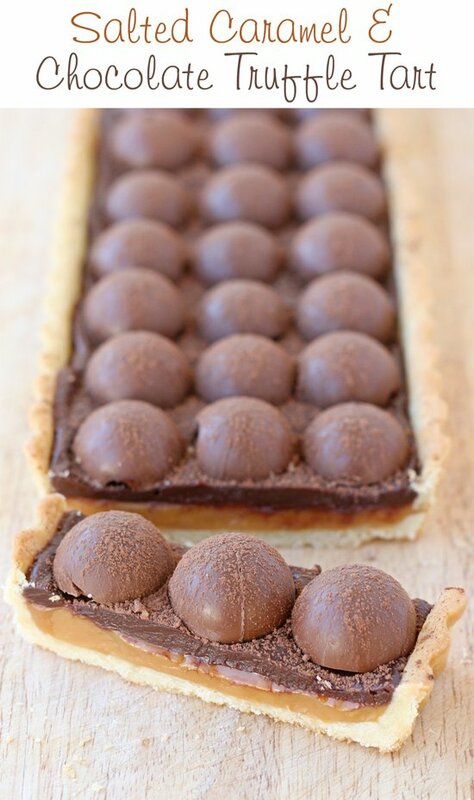 Rich, decadent and simply amazing… this Salted Caramel Chocolate Truffle Tart is a delicious and impressive dessert! 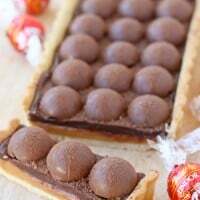 This beauty starts with a crisp shortbread crust, then a layer of salted caramel, rich chocolate ganache and is toped with Lindt LINDOR truffles. One bite and you will understand the #LINDORmelt… that moment when you taste the smooth, creamy LINDOR chocolate, and for a moment the world seems to melt away. 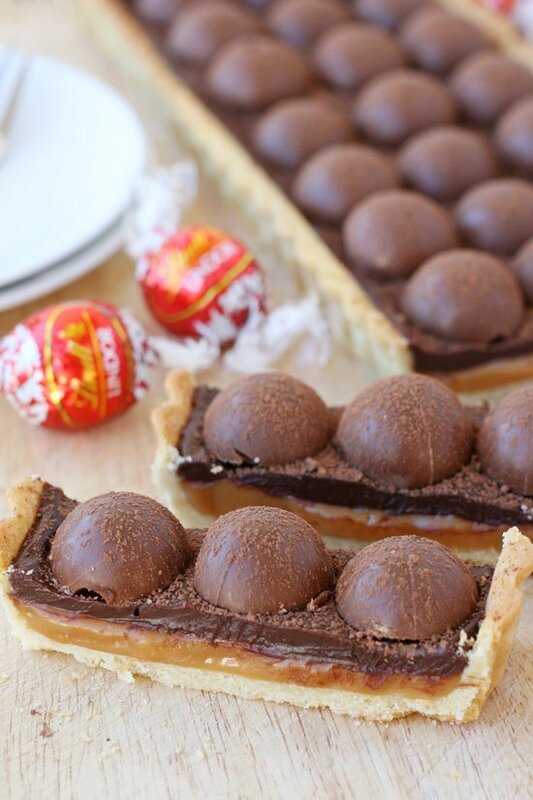 A crisp and buttery shortbread crust is topped with salted caramel, chocolate ganache and Lindt LINDOR truffles. An impressive and delicious dessert! Whisk egg yolk, cream and vanilla together in a small bowl and set aside. In a food processor, blend flour, sugar and salt about 5 seconds. Add butter cubes to the food processor and pulse until the mixture resembles cornmeal, about 15 seconds. With the machine running, add egg mixture and continue to process until dough begins to form, about 12 seconds. Wrap dough in plastic wrap and chill about 15 minutes. Roll dough between two pieces of plastic wrap, to about 1/4" thick. Roll dough in the general shape of your pan. I used a long rectangle (14"x4"), but you could use a round tart pan instead. Remove top layer of plastic wrap, then flip the dough over, into the pan, allowing it to hang over the sides. Ease dough into the pan by gently lifting edge of dough with one hand, while pressing the dough into the corners with the other hand. Leave any dough that is hanging over the edges in place for the moment. Gently press dough into the groves along the sides of the pan (adding bits of dough as needed), then roll a rolling pin over the top of the pan to trim off any excess dough. After 30 minutes (or more), remove tart from freezer, remove plastic wrap, and carefully press a sheet of foil into the frozen tart shell, covering the edges. Top foil with pie weights, dry beans or dry rice to weigh down the foil. Place prepared tart on a baking sheet and bake in a preheated 375*F oven for 30 minutes. After 30 minutes, carefully remove the pie weights and the foil and bake (uncovered) for an additional 5-10 minutes, until golden brown. Unwrap caramels and place in a bowl with heavy cream. Heat in the microwave for 3-5 minutes at 50% power, checking and stirring every minute or so. Once the caramels are melted, stir well and add salt. Stir, then set aside to cool a few minutes. Pour caramel into the (mostly) cooled crust. Move entire tart to the fridge and chill about 10 minutes. Prepare truffles by cutting them in half. 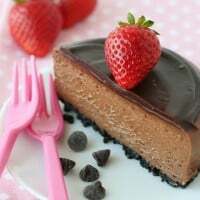 They do not have to be perfect pieces, but if you break a few, you can simply add them to the ganache (when you add the chopped chocolate to the cream, as directed below). Heat the cream in a bowl in the microwave until very hot (but no need to boil). Add chopped chocolate and then let it sit about a minute (if you have a few broken truffle pieces, you may add them as well). After a minute, stir until the chocolate is fully melted and well combined. Place bowl in the fridge and allow to thicken a bit. You want it to be just soft enough to pour, but thick enough that when you top it with the truffles they will stay in place (and not sink into the ganache). Check the fridge and stir ganache every 10 minutes or so until desired thickness is met. Pour chocolate on top of caramel layer, and spread as needed with an offset spatula. Top ganache with cut truffles, then dust tart with cocoa powder. Chill about 15 minutes, then serve at room temperature. To spread out the work a bit, feel free to make the tart crust a day in advance (and keep covered, at room temperature). Once prepared, the entire tart can be kept at room temperature (or in the fridge in warm weather) for a full day. I'm sure it would be perfectly fine even longer, but I always recommending enjoying baked goods when they are as fresh as possible. 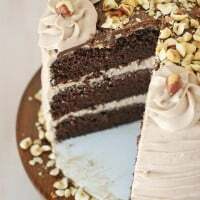 Recipe source - Final recipe by Glorious Treats, crust by Cooks Illustrated. 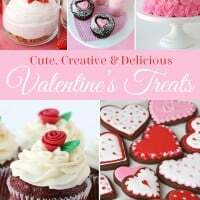 Wouldn’t this be an amazing treat to share with your Valentine? It has all the elements of a perfect Valentine’s Day dessert… it’s rich, beautiful and covered in chocolate! I chose a rectangle shaped tart pan for this dessert, but feel free to use a round tart pan if that’s what you have. Aren’t those Lindt LINDOR truffles just beautiful all lined up? 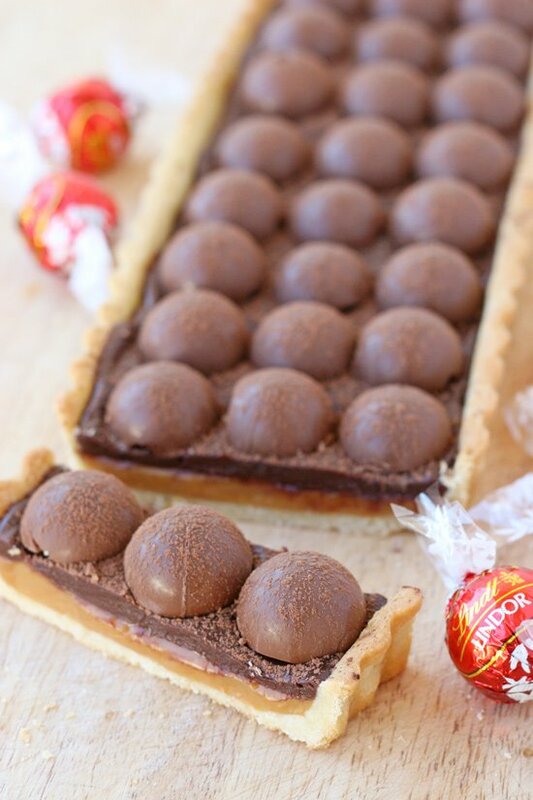 The truffles just add an extra layer of decadence to this tart. For a totally different, but equally beautiful look, you could roughly chop the truffles into quarters, and lay them jagged sides up for a more organic design. This post is sponsored by Lindt Chocolates. All text, images and opinions are my own. I only work with brands I use and love. The truffles on top of this look fabulous!! So yummy! Oh, My! This looks absolutely delicious! I’m definitely going to have to try these! This looks delicious! Looking forward to trying this out! Oh my goodness, this looks divine. Lindt chocolates are my favorite. Can’t wait to make this. Thank you!!!! O. M. G. GLORY!! Holy cow. I’m totally drooling. Those truffles…I can’t even buy them! Wish you were my neighbor! BTW, where did you purchase the pan? This looks amaaaazing!!! I will definitely be trying this recipe out! Love you! I neeeeedd these!! Love love love!! This sounds amazing!! I love salted caramel and chocolate . So I am sure it’s a win. What a gorgeous Tart!! I adore Lindor Truffles! 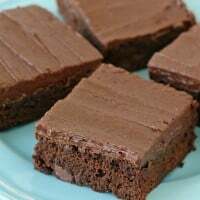 A definite Must Bake!!! OK I am an avid cook and baker and I honestly can say that I can’t remember the last time I have been so excited to try out a new recipe! I’ll let you know how it turns out, I don’t expect any complaints! This looks outstanding! I’m drooling!